Contributor Anthony Boutard once expressed a desire to open a restaurant where the waiters would carry, not baseball bat-sized pepper grinders, but small microplane graters and a stalk of horseradish to shave judiciously over diners' plates. Here he shares his secrets for serving the root, as well as his planting method at Ayers Creek Farm. Please note that the farm will be open this weekend, December 1st and 2nd, from 1 to 4 pm, with horseradish as well as their other products (see Anthony's note below for details). 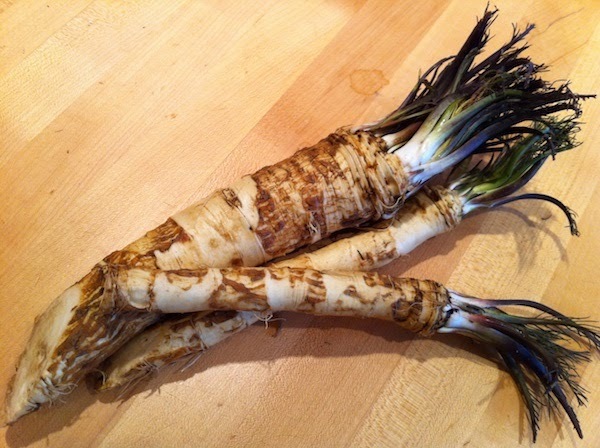 During the warm months, horseradish roots have an unpleasant earthy funk. 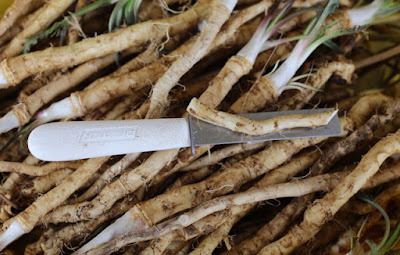 With the return of frosty and wet weather, the horseradish roots develop their flavor. Over the last two weeks, staff harvested about 120 pounds of horseradish. We pulled out the largest roots for our restaurant customers. We are mindful that prep labor is expensive and the larger roots are more efficient to peel and grate. As a result we have a lot of excellent medium-sized roots. Following the lead of Filene’s Basement and Nordstrom Rack, we will have a crate of medium sized horseradish roots available at $1 each. There will be a mixture of roots at a great price. 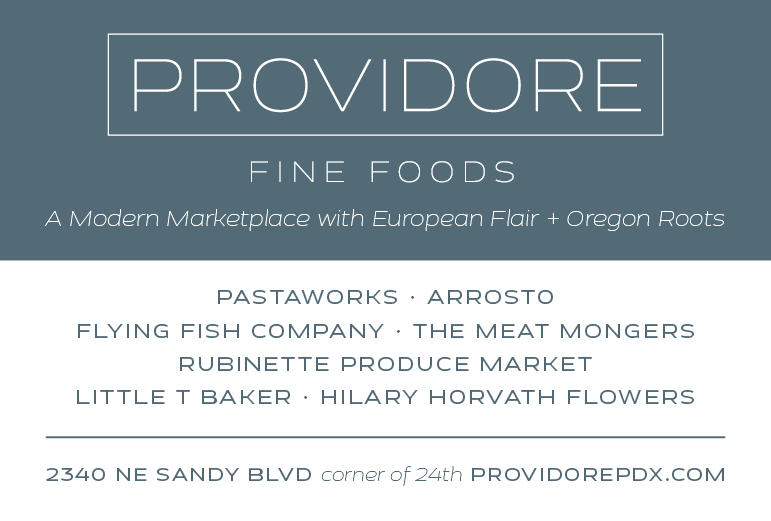 We encourage you to poke through the selection with a discerning eye and grab a handful of the best for the holiday season and beyond. The quality of these smaller roots is as good or better than the biggest. Wrap them up in a damp dish towel and store in a cool place such as the garage or under the eaves of the north side. They will store for weeks or even months. Pull a root out, peel and grate what you need. One of the soups we prepared for staff at Sweet Creek [on processing day for Ayers Creek Farm preserves] was a simple potato and onion soup using grain brine as the base. We grated a big container of horseradish to stir into the soup. There wasn’t a drop left. At Thanksgiving, grated horseradish was available to stir into the mashed potatoes. A bit of horseradish is welcome in salads or over a plate of oysters on the shell. We recommend trying it fresh rather than putting it in vinegar or cream. 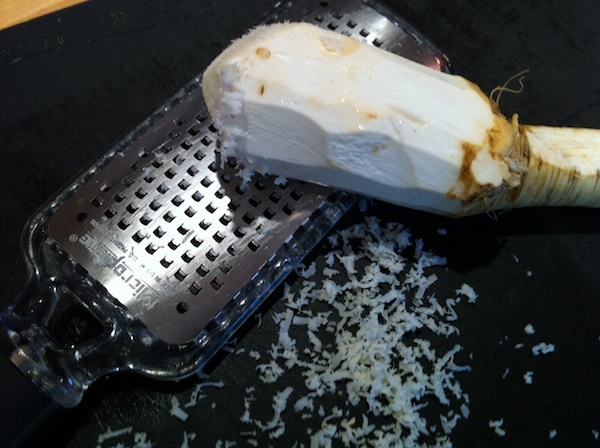 Freshly grated horseradish is a very different and more agreeable ingredient than the sour preserved stuff in a jar. Read the label and you will notice that virtually all brands are fortified with mustard oil, an indignity that also afflicts cheap brands of wasabi. The smallest roots are put aside and used for replanting the patch. For some reason, people often assume the leafy crowns are best for planting, but this is not the case. The best crops are propagated using short root cuttings, about five to six inches long. The bottom is cut at an angle to orient it, as shown below. The cutting is poked into the ground at a 35° to 45° angle. That’s it. If you want to buy some roots for establishing your own patch, ask us and will happily sell you some cutting grade roots. Bear in mind, once established, horseradish is notoriously tenacious and will hang around for a century or more. Not for the ambivalent. To maintain its quality, we add generous amounts of sea salt, gypsum and sulphate of potash. Read Part One about producing Ayers Creek Farms justly-renowned preserves.